Three rolls of Jiffy furnisoft, each roll being 1200mm wide x 100 metres in length (1200mm x 100M). Furni-SOFT is designed specifically to protect furniture with delicate surfaces from knocks, scuffs and abrasion. 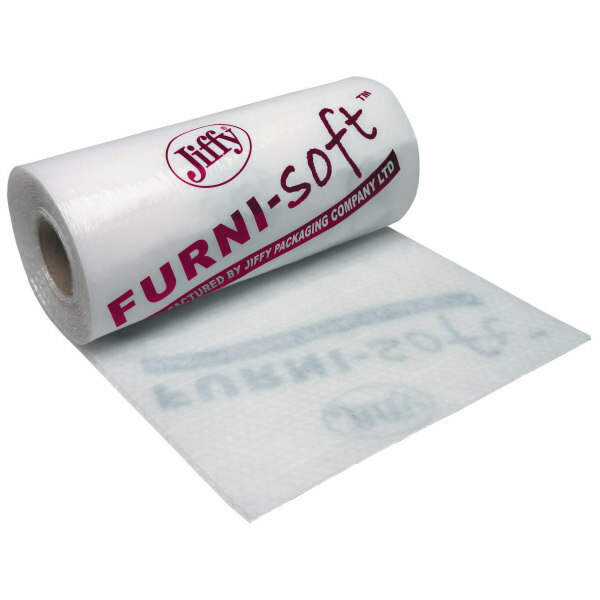 Furnisoft contains a sandwich construction with Astro Bubble laminated to a printed LDPE film on one side and a simulated paper LDPE on the other side. Furni-SOFT combines all the protective qualities of Furni-GUARD with an extra gentle, non-abrasive layer. Customers looking for a modern alternative to woollen blankets have been impressed with the presentation and protection Furni-SOFT has to offer.